It's here again. Arlington gets Cajun is back. Last year was deemed to be the best yet, with £1000 raised for MS Society, but this year we're going to smash that! The Cajun Dawgs and friends, Strum'n'Bass, Dave Beckett, Rough Chowder, Bar, BBQ. Arlington Village Hall, Arlington East Sussex. Come and join the Village of Arlington in the old Marquee in the Glebe field next to the Village Hall. There will be a bar-b-que (run by Demelza Hospice Care for Children ) and a bar.It all kicks off at 7pm, with laid back blues from Dave Beckett then rocking covers and originals from the very original duo Strum'n'Bass . Rough Chowder will segue seamlessly into the rocking Cajun Style finale from the Cajun Dawgs and friends. Art, Music, Picnics, Dancing, Church Service and more Picnics! In the Village Hall field Saturday and Sunday 12 noon - Marquee if the weather is damp. 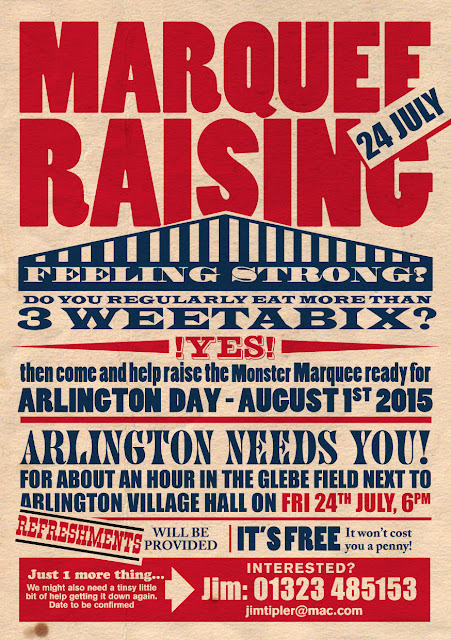 Come along to Arlington Day 2015! Free events during the day including an Art & Craft Show , free live folk music presented by Folk is Not A Rude Word, a village picnic and in the evening there will be a bar and barbeque and the ticketed Arlington Gets Cajun event. Tickets from www.cajunrockers.com now! The Cajun Dawgs, Jeremiah Longshanks, Dance Workshop with Satu Phillips, Bar, Bring your own picnic. Arlington Village Hall, Arlington East Sussex. 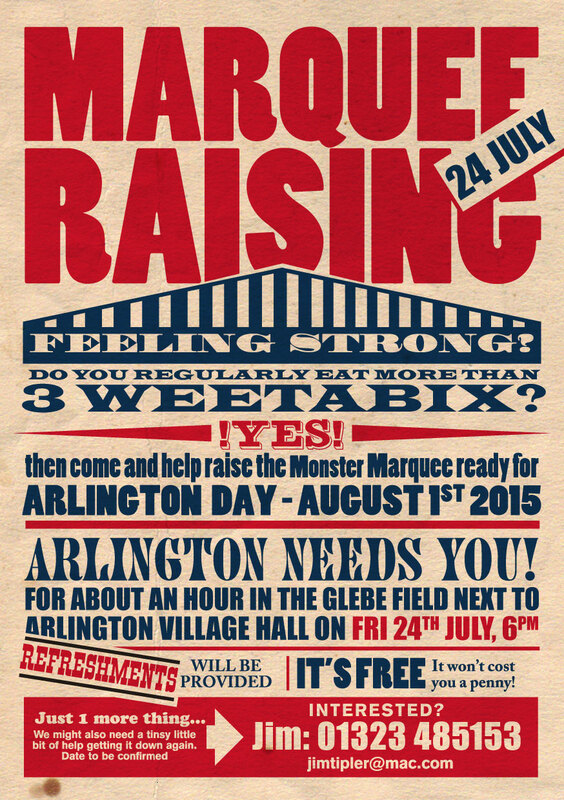 Come and join the Village of Arlington in the old Marquee in the Glebe field next to the Village Hall. We won't be doing food this year, so bring your own picnic. But there is a paying bar. It all kicks off at 7pm, when you can eat your picnic either on a blanket in the field or in the marquee, listening to the awesome one man blues machine that is Jeremiah Longshanks (aka Jez Walker). Then have a go at the Cajun 2-step or waltz under the guidance of Satu. Finally rock out Cajun Style to the Cajun Dawgs and friends. Date for your diary - 19th July 2014. 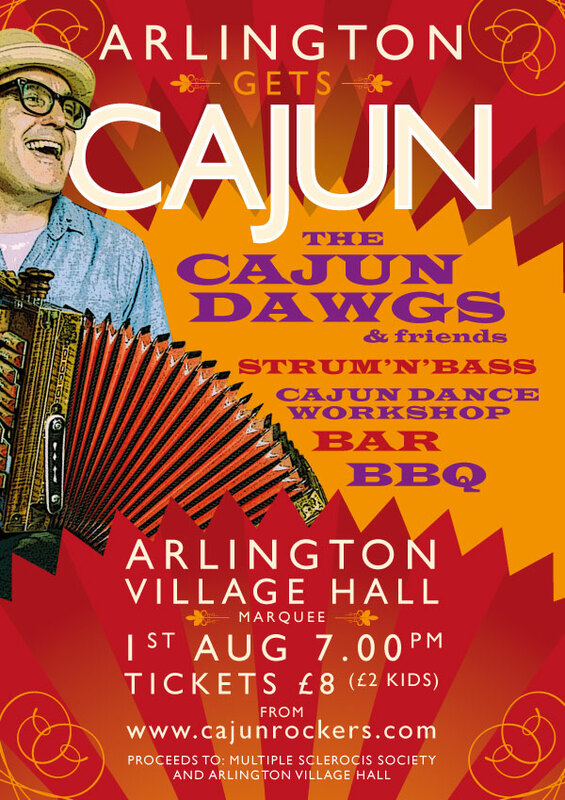 The Cajun Dawgs and friends will return to get everyone up and dancing in the marquee next to the Arlington Village Hall. Tickets will be available soon - keep checking back here or on the Cajun Dawgs' website, www.cajunrockers.com, or email Jim. 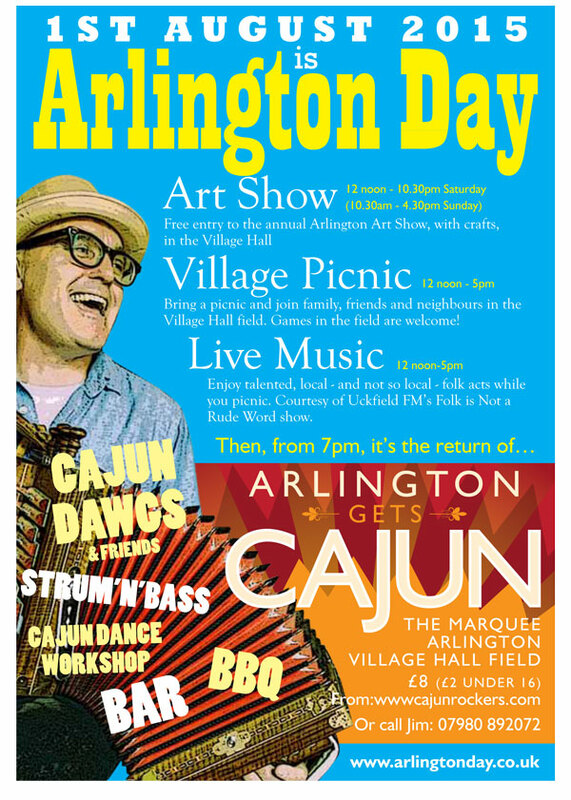 As part of Arlington Arts Festival 2013, the A Team (Arlington Team) are arranging another Cajun dance and music night. Saturday 15th June, 7.30pm in the marquee next to Arlington village hall. Please note that there MAY be road closures in Arlington by Abbots Wood so it is best to approach the village either from Wilmington or Berwick direction. If travelling from the Hailsham direction head towards Upper Dicker, turn left towards Berwick then left after the station towards Arlington. shakey start to the video because the dance floor was so packed! Great night. and we'd love you to be involved.